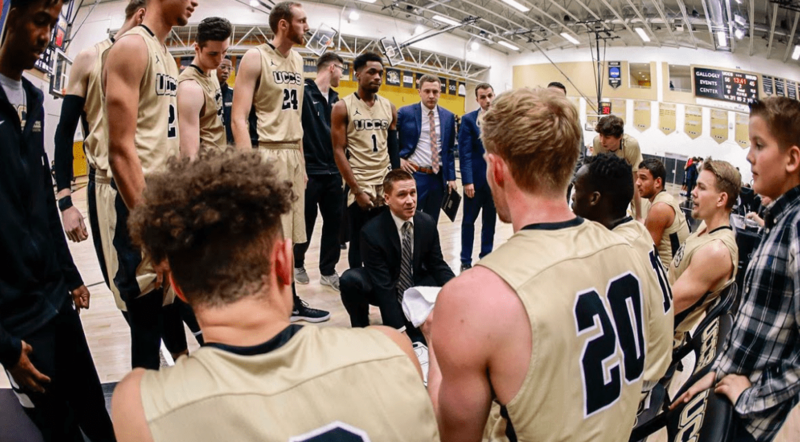 The UCCS men’s basketball team opened its home schedule with a dominating 106-64 win over the Tigers of Colorado College (CC) on Nov. 26. The victory over a local rival ended a three-game losing streak for the Mountain Lions, and marked the end of their non-conference schedule. UCCS was able to pull ahead fast, opening the night with 12 unanswered points only four minutes into the game. Following a few scores by the Tigers, the Mountain Lions posted up 19 more unanswered points to put the score at 31-5 with nine minutes left in the opening half. UCCS junior and 2017-18 RMAC honorable mention Padiet Wang led the Mountain Lions with seven rebounds, 18 points, shooting 63 percent on his field goals (7-11), and netting all four of his free throws. His 18 points set a new personal best for the season, with his previous best having been 16 points versus Tarleton State. Four other Mountain Lions scored in the double digits, red-shirt sophomore Brandon Malone (13), sophomore Isaiah Wilson (13), red-shirt junior Blend Avdili (12) and red-shirt sophomore Ian MacDonald (11). MacDonald led the Mountain Lions in field goal percentage, shooting 83 percent for the night. The 106 points put up by UCCS smashed their previous season high of 87. The Mountain Lions also posted season high numbers in shots taken (71), shots made (42), assists (21) and steals (23). UCCS finished the night shooting 59.2 percent after making 42 of their 71 attempts. It was the first time this season the Mountain Lions averaged more than 50 percent from the floor, and was a sizeable improvement over the previous two games, in which UCCS shot for only 41.5 percent and 33.3 percent. The Mountain Lions’ defense was key throughout the game, totaling 23 steals throughout the match as opposed to the Tigers’ six. UCCS posted a season high of 44 points off turnovers, while CC was only able to post 13. In its four previous games this season, UCCS had only averaged 17.25 points off turnovers per game. The UCCS bench was also reliable in providing points when called upon, taking credit for 40 percent of the team’s total points. The 43 points from the bench beat the team’s previous season high of 34 against Nebraska-Kearney. The Tigers managed just 20 points from their bench players. CooXooEii Black, a junior at CC led the Tigers with 25 points scored, with freshman Aaron Acosta being the only other tiger to post double digit points (13) The Tigers failed to gain momentum early, shooting only 32.14 percent (9-28) in the first half, and faced a 52-23 deficit at halftime. CC ended the night shooting 46.6 percent, hitting 27 field goals on 58 attempts. The victory puts UCCS at 2-3 overall for the season, with RMAC conference play set to begin on Dec. 1 against the Orediggers of the Colorado School of Mines. The Orediggers will enter the game with a two game win streak, and a 3-3 overall record. A victory will give UCCS head coach Jeff Culver his 100th win at the program.